The 2010 Crawford Fund fellowship was awarded to Ms Le Thi Minh Hangh from the Department of Bacteriology, National Institute of Veterinary Research in Hanoi, Vietnam. Streptococcus suis is a cause of serious disease in pigs and associated, fortunately rarely, with fatal infections in humans. While not a common disease transmitted from animals to humans in Australia, an article in the Medical Journal of Australia back in 2008 considered two cases of Streptococcus suis endocarditis in Australian piggery workers. 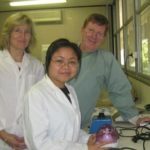 To help Vietnam improve both the diagnostic and research services for this important pig disease, Dr Le Thi Minh Hang from the Department of Bacteriology, National Institute of Veterinary Research in Hanoi, Vietnam is currently receiving one month’s training at the Animal Research Institute (ARI), Yeerongpilly, Queensland with the support of the non-profit NGO the Crawford Fund. Dr Le was chosen from a group of international candidates for the prestigious Crawford Fund Fellowship, which is provided annually to further training of a scientist in agriculture, fisheries or forestry whose work has shown significant potential. “Dr Le represents the new generation of emerging researchers who will service the future needs of Vietnam agriculture, particularly in the livestock area which is becoming increasingly important with the prosperity driven expansion in demand for animal protein,” said Dr Eric Craswell, Director of the Crawford Fund’s training program. Dr Pat Blackall from the ARI explains the benefit to the Australian pig industry. “She will definitely value-add to the range of specialised reference services already provided to the Australian pig industry by the Microbiology Research Group within Agri-Science Queensland,” said Dr Pat Blackall, Research Manager at Poultry CRC and Research Scientist at the Queensland Government’s Agri-Science Queensland Animal Research Institute, who is assisting with the training. “Her four-week research project, involving the development of a rapid diagnostic test for Streptococcus suis, will provide more sustainable and cost-effective disease prevention and control programs for pig producers in Australia and Vietnam,” he said.